Lonne Van Den Kieboom’s busy shifts as a marine engineer means she sleeps in all sorts of places. Through all life’s adventures, whatever the stage in your menstrual cycle, night should be a time for total peace of mind. Whether you’re snoozing in a bunk or a king-size bed, you should have the freedom to move as you choose, without ever having to worry about leaks during your period. That’s why we’ve created Bodyform Ultra Goodnight Extra Large towels. They have a wider front and back plus anti-leak barriers to ensure total comfort and protection all night long, whatever positions you sleep in. You deserve to feel good in the morning, and this shouldn’t change during your period. 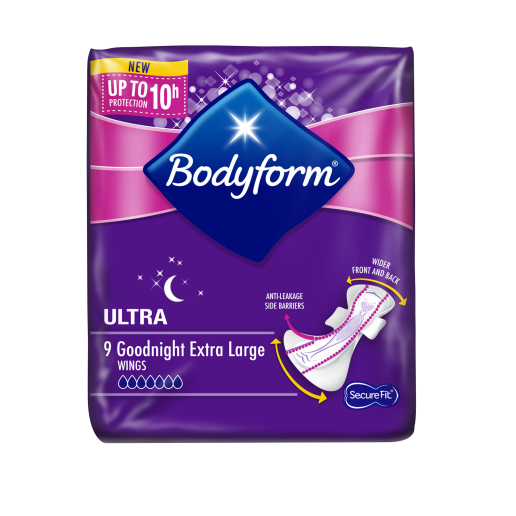 OurSecureFit™ Bodyform Ultra Goodnight towels use super-gel technology to absorb blood quickly and effectively. So, when it’s time to rise you’ll feel nothing but fresh, relaxed and ready for a new day.